Of all my puzzles created, the one that is not yet copied is the Hyper Sudoku 3D (Rules of Sudoku 3D). This means that you could only find them on Innoludic. This puzzle allows me a lot of variety in creating them by using 1) different sizes: from 4x4x4 to 8x8x8, 2) configurations: two or three cubes, 3) variants : with regular or irregular regions. This is not surprising that this puzzle, the Hyper Sudoku 3D, pleases a lot of people who want to try something else than the usual classical Sudoku. I provide you three puzzles to illsutrate the richness of this puzzle. The first one is an aggregate of three 4x4x4 cubes. The peculiarity of this puzzle is that each row and column spreads on two faces of the cube. This is the rule for the Sudoku 3D, but for the Hyper Sudoku we need an additional rule, because the puzzle has more than on cube, a portion of a row or column appearing on a face of a cube could also form a row or column with the face of the next cube (the two faces of the two different cubes must be adjacent). So try this one , use numbers from 1 to 8. The second one is similar to the first (same size, configuration and number of cube) except that now the regions have irregular (Jigsaw) shapes. Finaly the last one has only two cubes with irregular regions however the size of the cubes are larger : 6x6x6, then use number 1 to 12. The good new is that you could find these puzzles in my two books. With these two books, your crave for these puzzle will be filed !! It has been a long time since I published Hyper Soduku Challenge 1 (2014). Then I have decided to give you a suite Hyper Sudoku Challenge 2, the reasons for the delay between the two publication dates are numerous: Other activities, procrastination, laziness etc.., but this is not very important to know why, the most important is to know when, and when is now !!. So for all the lovers of these puzzles this is a good new and for the other... then this is a good occasion to try these puzzles. This is the kind of puzzle (Rules of Sudoku 3D) that you will find inside. 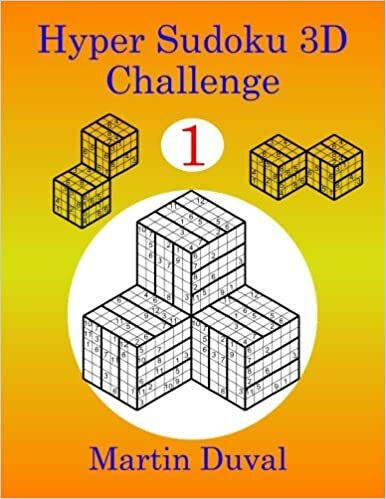 This is 3 Hyper Sudoku 3D puzzles (Rules of Sudoku 3D) with size 4x4x4 (you must use number 1 to 8). As I Believe this is the only place on the web that you can find these kinds of puzzle. 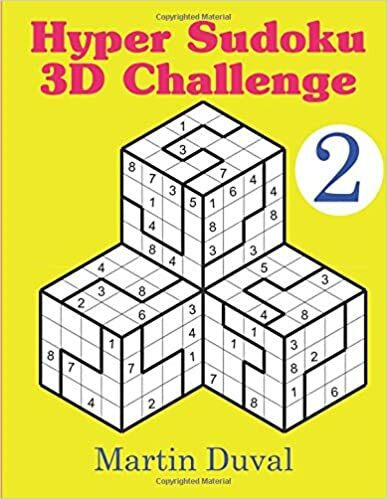 For the fans of this puzzle : you will be pleased to learn that 2 new books on Sudoku 3D and Hyper Sudoky 3D are comming soon.